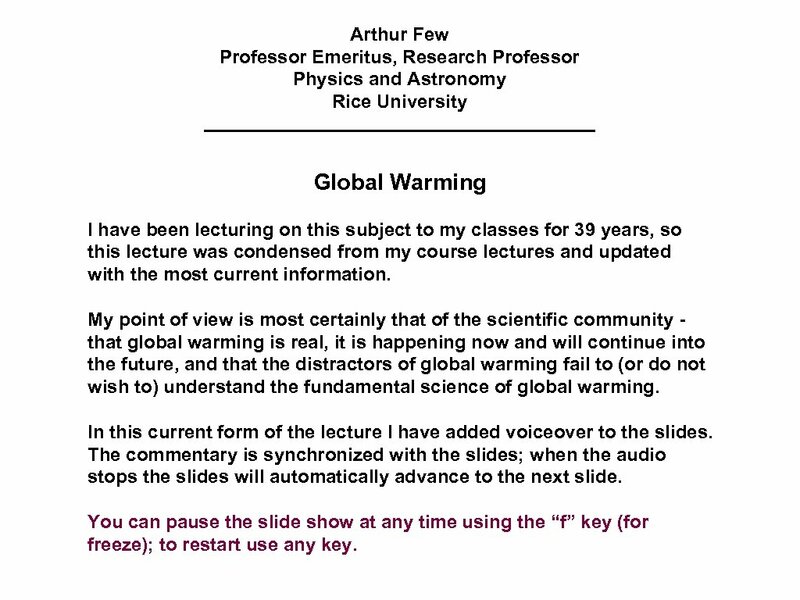 Arthur Few Professor Emeritus, Research Professor Physics and Astronomy Rice University Global Warming I have been lecturing on this subject to my classes for 39 years, so this lecture was condensed from my course lectures and updated with the most current information. 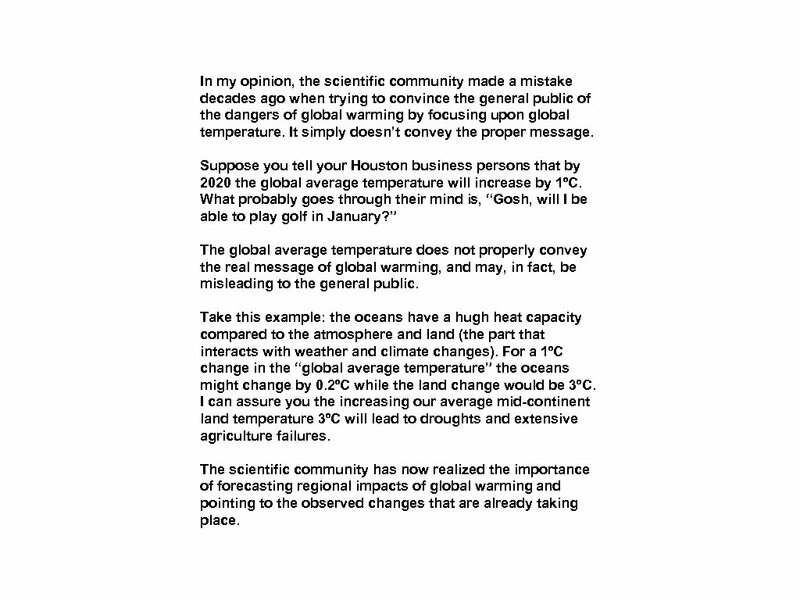 My point of view is most certainly that of the scientific community that global warming is real, it is happening now and will continue into the future, and that the distractors of global warming fail to (or do not wish to) understand the fundamental science of global warming. In this current form of the lecture I have added voiceover to the slides. The commentary is synchronized with the slides; when the audio stops the slides will automatically advance to the next slide. You can pause the slide show at any time using the “f” key (for freeze); to restart use any key. 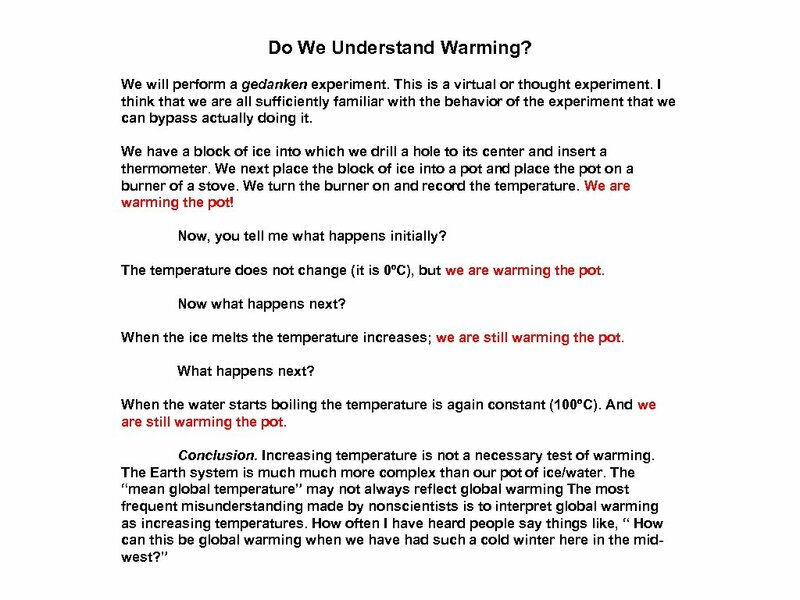 Part 1: General discussion of temperature and warming, and why there is a disconnect between the scientist and the nonscientist. 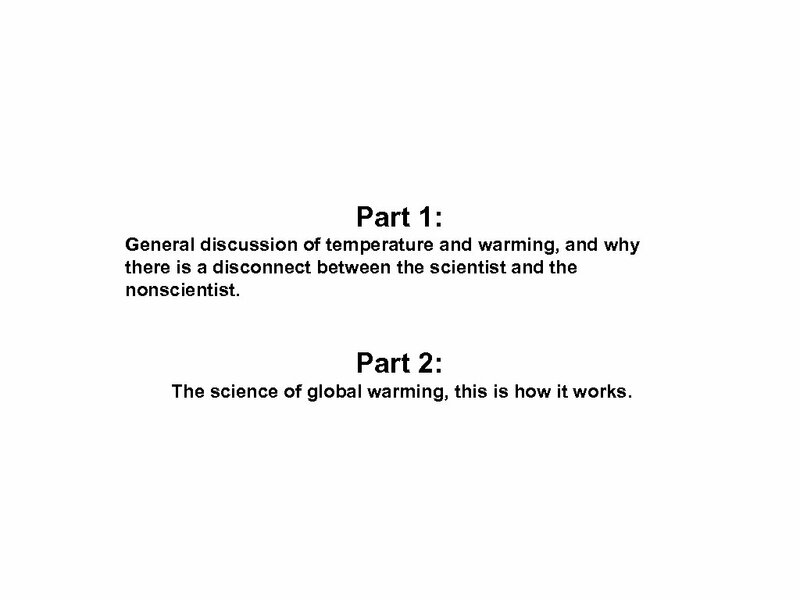 Part 2: The science of global warming, this is how it works. 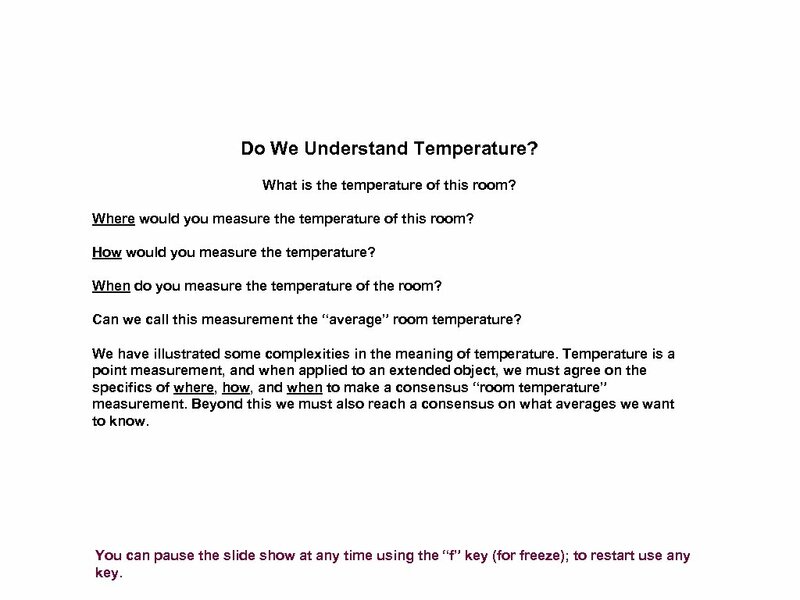 Do We Understand Temperature? What is the temperature of this room? Where would you measure the temperature of this room? How would you measure the temperature? When do you measure the temperature of the room? Can we call this measurement the “average” room temperature? We have illustrated some complexities in the meaning of temperature. Temperature is a point measurement, and when applied to an extended object, we must agree on the specifics of where, how, and when to make a consensus “room temperature” measurement. Beyond this we must also reach a consensus on what averages we want to know. You can pause the slide show at any time using the “f” key (for freeze); to restart use any key. 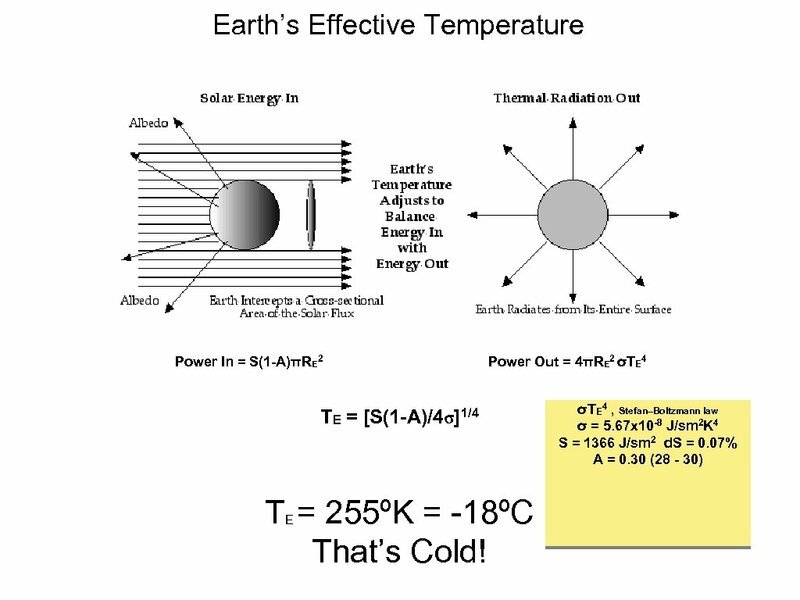 So, what is the temperature of the Earth? Where do we place thermometers? How do you average these spatially diverse measurements? How long should the record be to give a significant average measurement? Difficult as it might be there are experts that labor over the global data set and carefully weigh the quality and distribution of the data to achieve the mean global temperature and its changes over time. These are peer reviewed and become consensus determinations. 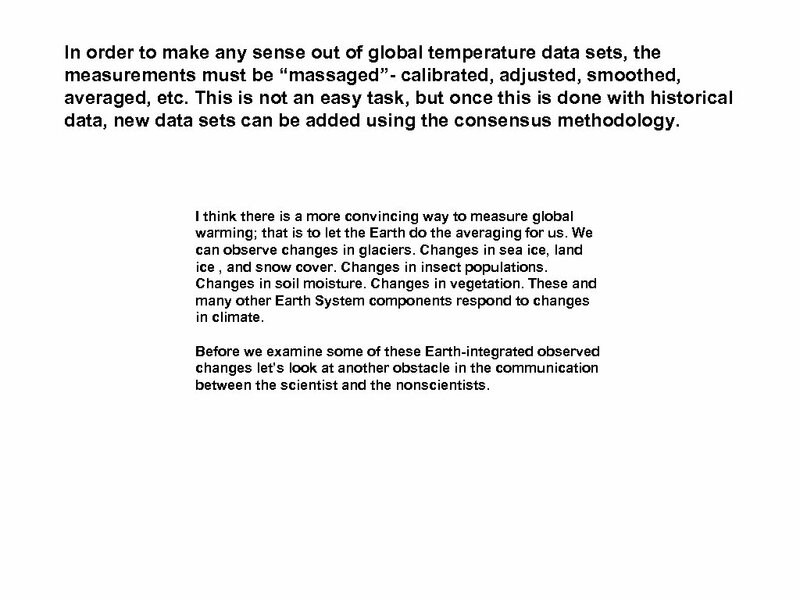 The following slide provides a summary of the many attempts to determine the global temperature. I recommend that you pause the next slide after the commentary is finished and study the slides details. You can pause the slide show at any time using the “f” key (for freeze); to restart use any key. 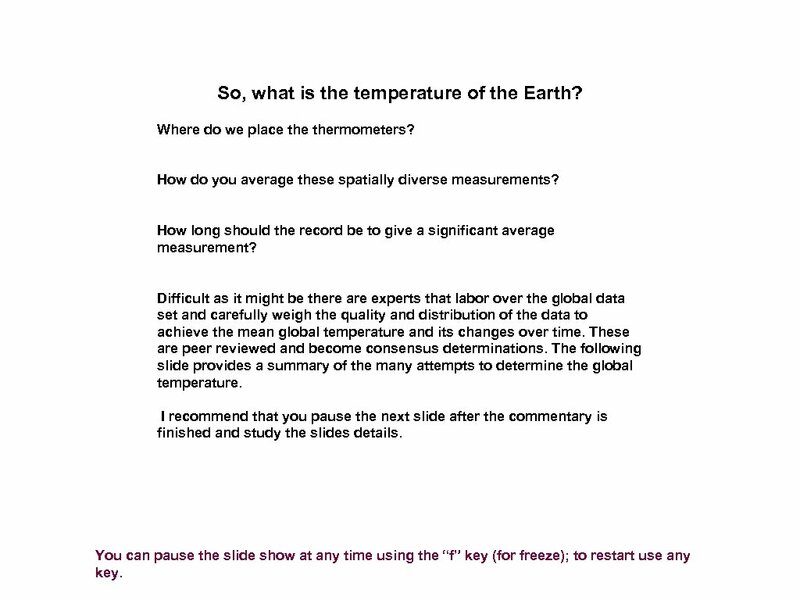 In order to make any sense out of global temperature data sets, the measurements must be “massaged”- calibrated, adjusted, smoothed, averaged, etc. This is not an easy task, but once this is done with historical data, new data sets can be added using the consensus methodology. I think there is a more convincing way to measure global warming; that is to let the Earth do the averaging for us. We can observe changes in glaciers. Changes in sea ice, land ice , and snow cover. Changes in insect populations. Changes in soil moisture. Changes in vegetation. These and many other Earth System components respond to changes in climate. Before we examine some of these Earth-integrated observed changes let’s look at another obstacle in the communication between the scientist and the nonscientists. In my opinion, the scientific community made a mistake decades ago when trying to convince the general public of the dangers of global warming by focusing upon global temperature. It simply doesn’t convey the proper message. Suppose you tell your Houston business persons that by 2020 the global average temperature will increase by 1ºC. What probably goes through their mind is, “Gosh, will I be able to play golf in January? ” The global average temperature does not properly convey the real message of global warming, and may, in fact, be misleading to the general public. 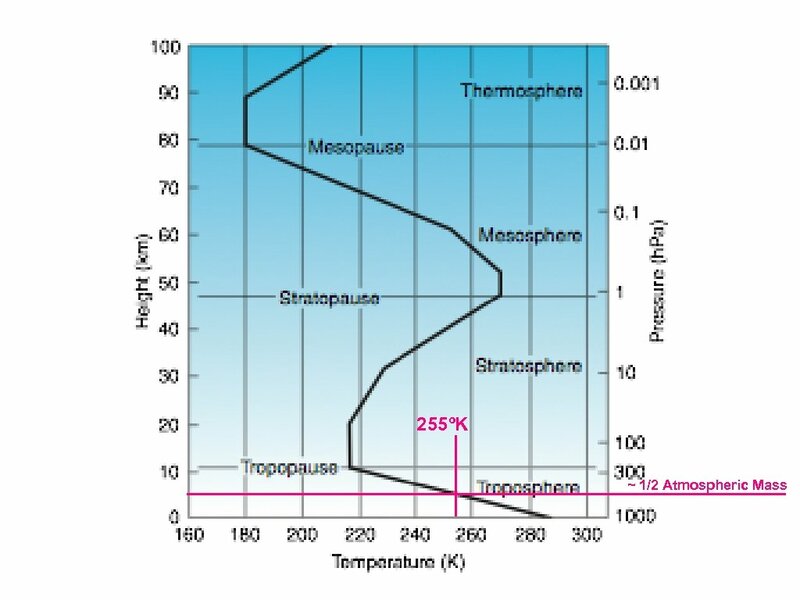 Take this example: the oceans have a hugh heat capacity compared to the atmosphere and land (the part that interacts with weather and climate changes). For a 1ºC change in the “global average temperature” the oceans might change by 0. 2ºC while the land change would be 3ºC. I can assure you the increasing our average mid-continent land temperature 3ºC will lead to droughts and extensive agriculture failures. The scientific community has now realized the importance of forecasting regional impacts of global warming and pointing to the observed changes that are already taking place. 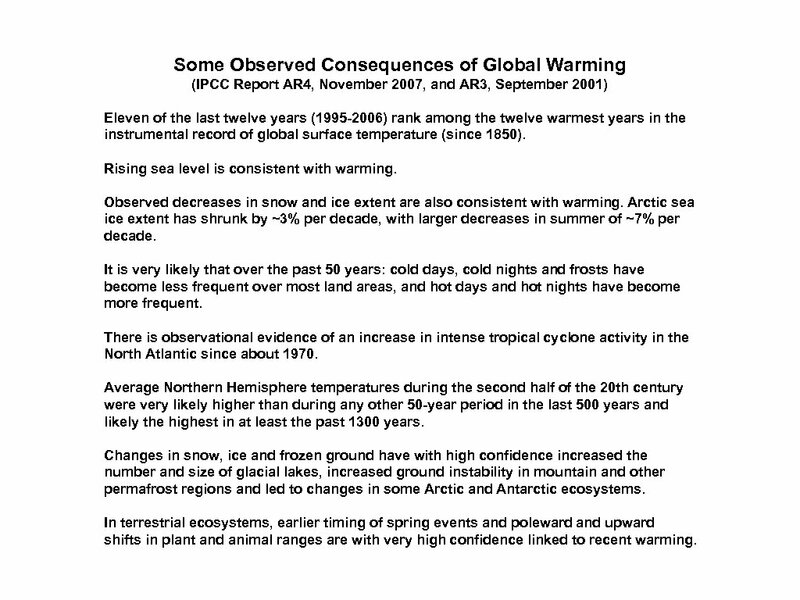 Some Observed Consequences of Global Warming (IPCC Report AR 4, November 2007, and AR 3, September 2001) Eleven of the last twelve years (1995 -2006) rank among the twelve warmest years in the instrumental record of global surface temperature (since 1850). Rising sea level is consistent with warming. Observed decreases in snow and ice extent are also consistent with warming. Arctic sea ice extent has shrunk by ~3% per decade, with larger decreases in summer of ~7% per decade. It is very likely that over the past 50 years: cold days, cold nights and frosts have become less frequent over most land areas, and hot days and hot nights have become more frequent. There is observational evidence of an increase in intense tropical cyclone activity in the North Atlantic since about 1970. Average Northern Hemisphere temperatures during the second half of the 20 th century were very likely higher than during any other 50 -year period in the last 500 years and likely the highest in at least the past 1300 years. Changes in snow, ice and frozen ground have with high confidence increased the number and size of glacial lakes, increased ground instability in mountain and other permafrost regions and led to changes in some Arctic and Antarctic ecosystems. In terrestrial ecosystems, earlier timing of spring events and poleward and upward shifts in plant and animal ranges are with very high confidence linked to recent warming. There has been a widespread retreat of mountain glaciers in non-polar regions during the 20 th century. It is likely that there has been about a 40% decline in Arctic sea-ice thickness during late summer to early autumn in recent decades and a considerably slower decline in winter sea-ice thickness. Tide gauge data show that global average sea level rose between 0. 1 and 0. 2 meters during the 20 th century. Warm episodes of the El Niño-Southern Oscillation (ENSO) phenomenon (which consistently affects regional variations of precipitation and temperature over much of the tropics, sub-tropics and some mid-latitude areas) have been more frequent, persistent and intense since the mid-1970 s, compared with the previous 100 years. Ocean waters are becoming more acidic as they soak up carbon dioxide, the main global warming gas. And while there's evidence that coral reefs can find ways to adapt to waters warmed by global climate change, there's no proof that they can cope with more-acidic oceans. But a new research paper in the journal Science says their problems may be getting worse. The paper says as much as a third of the world's coral species may now be headed toward extinction. Climate change is "largely irreversible" for the next 1, 000 years even if carbon dioxide (CO 2) emissions could be abruptly halted, according to a new study published in this week's Proceedings of the National Academy of Sciences (1/29/09). This is because the oceans are currently soaking up a lot of the planet's excess heat — and a lot of the carbon dioxide put into the air. The carbon dioxide and heat will eventually start coming out of the ocean. And that will take place for many hundreds of years. This component is the albedo. 72% is from the atmosphere. 28% is from the surface. 83% of IR out 17% of IR out Also, the global mean includes the polar regions. By the way, the tropical cloud tops are colder than the polar regions. When viewing the Earth from space in the infrared, you see mostly the atmosphere and clouds; the surface contributes but a small fraction. The atmosphere and clouds are much colder than the surface. A small fraction of the surface radiation passes through the atmosphere to space. 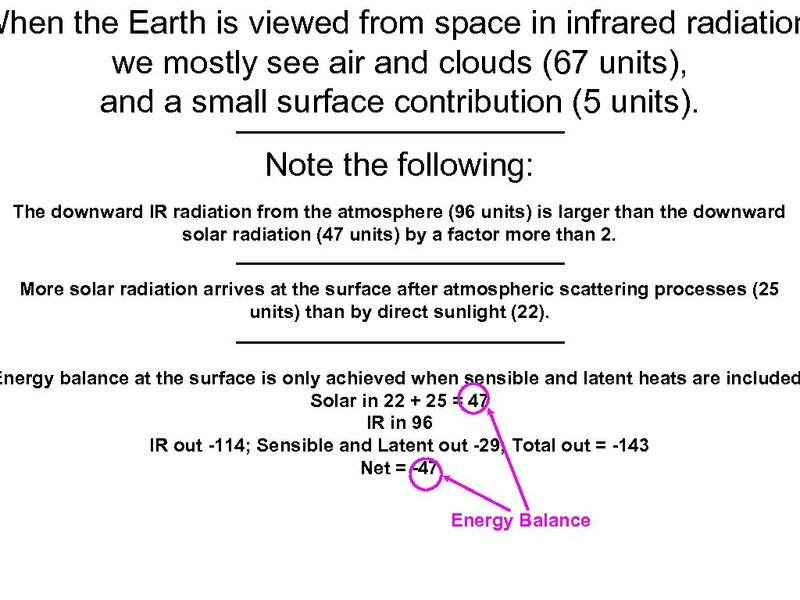 Most of the surface radiation is absorbed in the atmosphere and warms the atmosphere. This is how it works. a(0 -1) = absorbtivity = emissivity (Kirchhoff’s Law): the fraction of the total radiation that is absorbed or emitted. Earth now: a = 0. 766 close to the upper limit for a 1 -layer atmosphere. The warmed atmosphere radiates upward to space and downward to the surface. 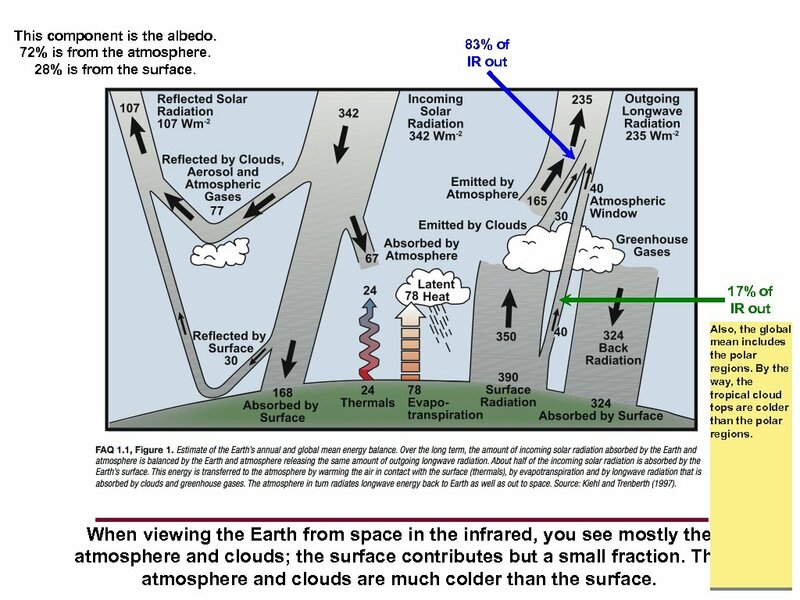 Most of the solar radiation that is not reflected (albedo) passes though the atmosphere and warms the Earth’s surface. The atmosphere is depicted as a layer above the Earth’s surface. The warm surface radiates infrared radiation upward. 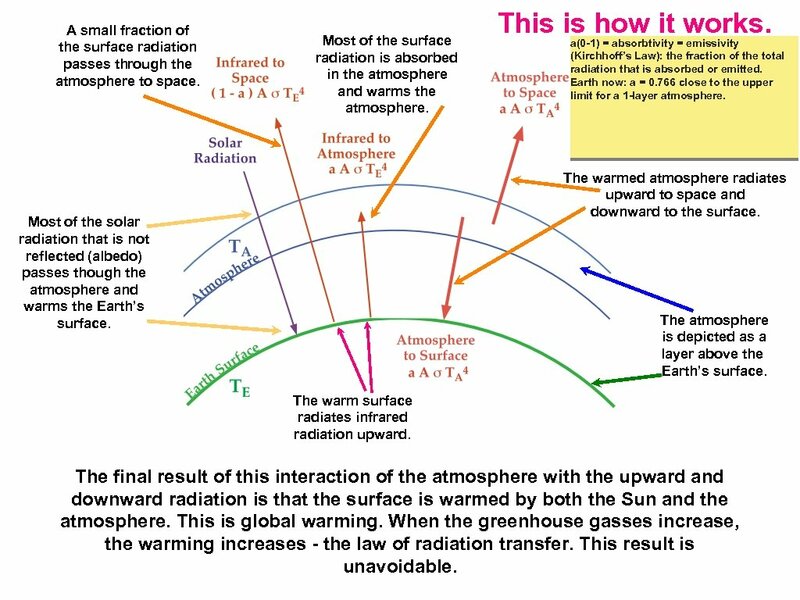 The final result of this interaction of the atmosphere with the upward and downward radiation is that the surface is warmed by both the Sun and the atmosphere. This is global warming. 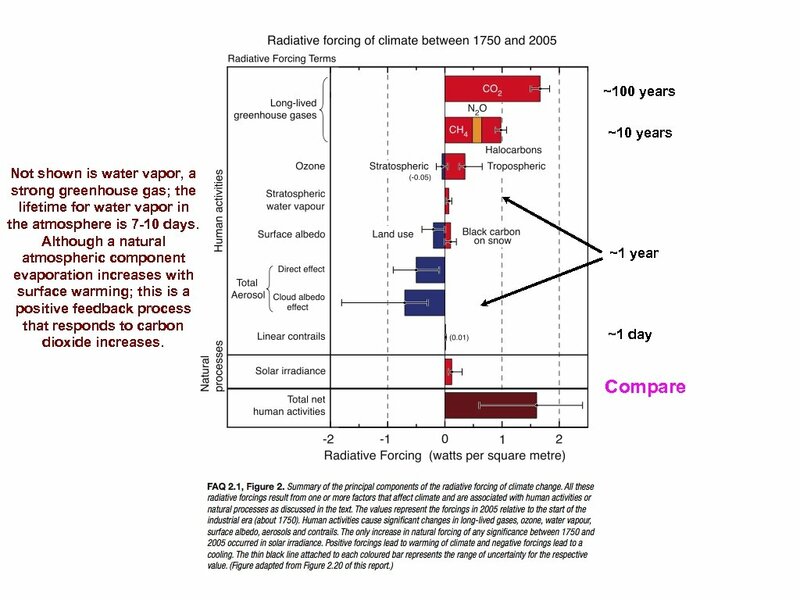 When the greenhouse gasses increase, the warming increases - the law of radiation transfer. This result is unavoidable. The next step is to use a multilevel model for an atmosphere. Current large numerical models for Earth use at least 15 layers. Consider the 2 -layer model here. Venus: A=0. 75 TE=232 K Earth: A=0. 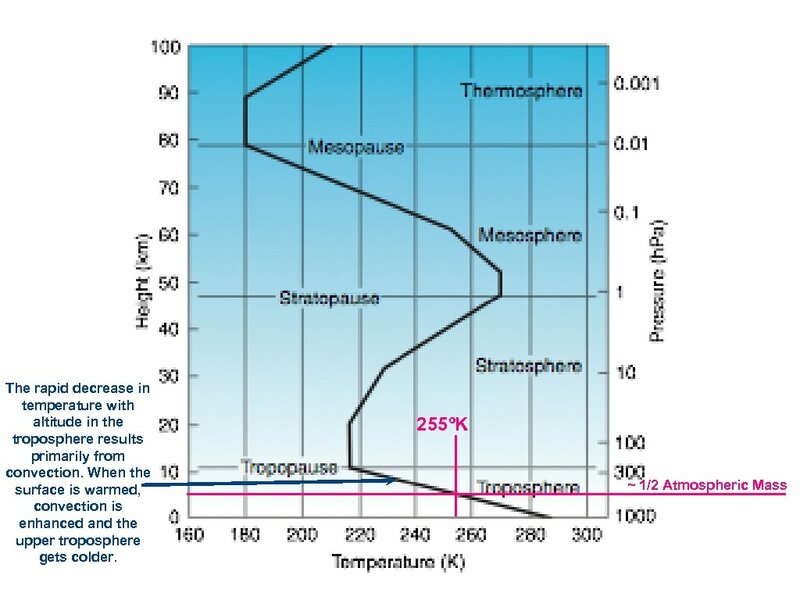 30 TE= 255 K Venus: TS=737 K Earth: TS= 288 K Greenhouse V = 505 K( or C) Greenhouse E = 33 K (or C) Using the simple model on this slide for Venus requires 19 layers of atmospheres! 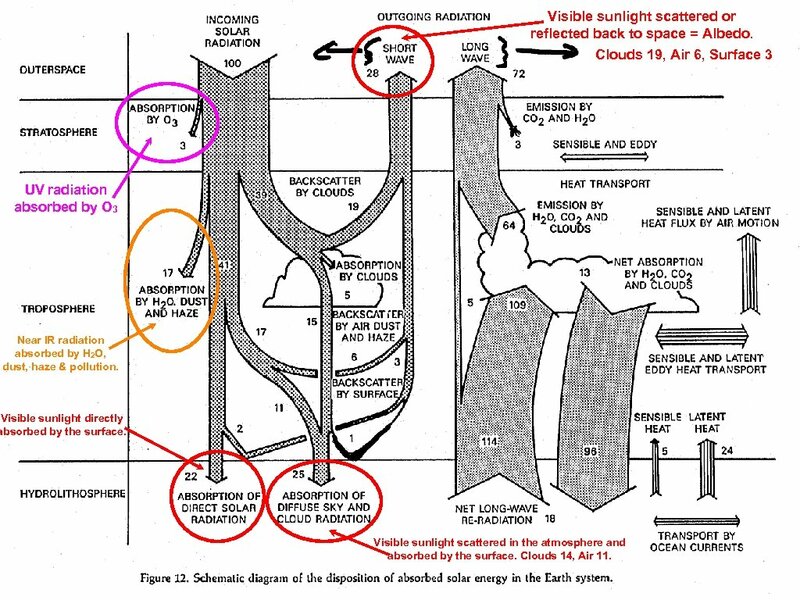 Simplified greenhouse model of two internally isothermal atmospheric layers but with different temperatures. The upward and downward fluxes at each level must be equal. Start at the top level; one F down must be matched by one F up. Each layer must radiate the same flux down that it radiates up; thus the top layer radiates one F down. 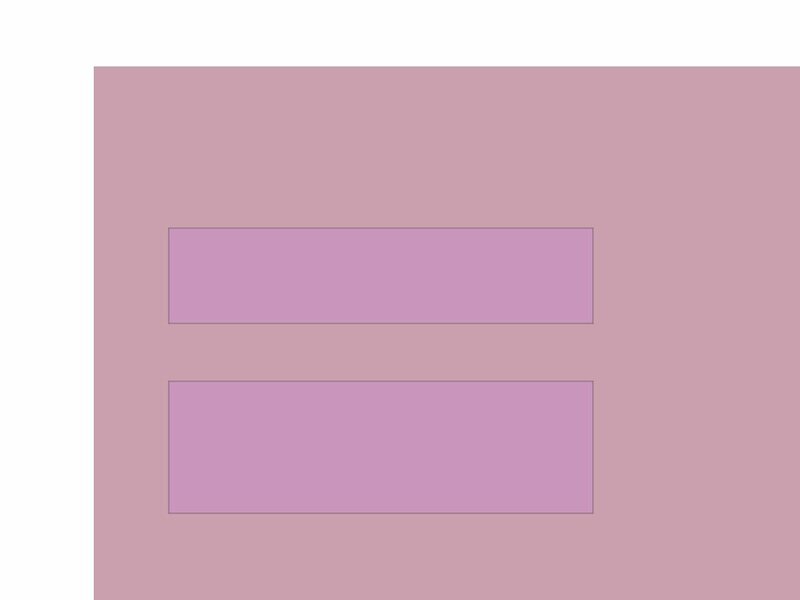 Now there are two Fs down into the bottom layer, which must be matched by two Fs up and down. This makes three Fs down to the surface, which must radiate three Fs up. The temperature must increase downward because the lower layers must radiate more flux than the higher layers. 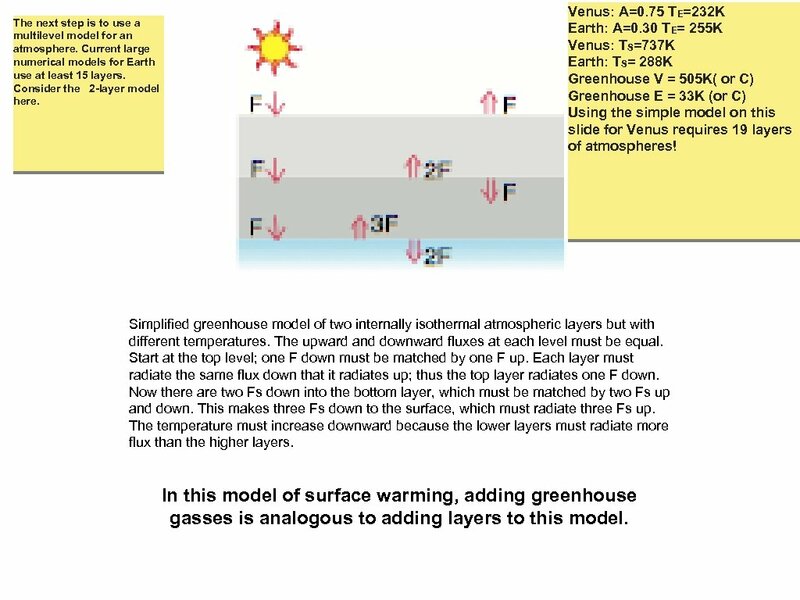 In this model of surface warming, adding greenhouse gasses is analogous to adding layers to this model. Primarily visible 100 units in. Visible 28, Infrared 72 100 units out. Radiation energy transfer in the Earth system; short wave (visible) and long wave (infrared). Visible sunlight scattered or reflected back to space = Albedo. Clouds 19, Air 6, Surface 3 UV radiation absorbed by O 3 Near IR radiation absorbed by H 2 O, dust, haze & pollution. Visible sunlight directly absorbed by the surface. Visible sunlight scattered in the atmosphere and absorbed by the surface. Clouds 14, Air 11. 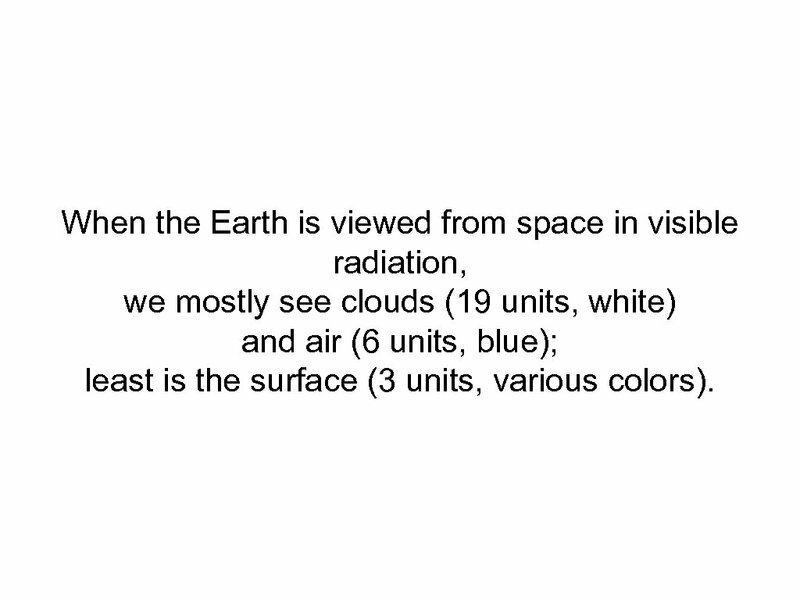 When the Earth is viewed from space in visible radiation, we mostly see clouds (19 units, white) and air (6 units, blue); least is the surface (3 units, various colors). 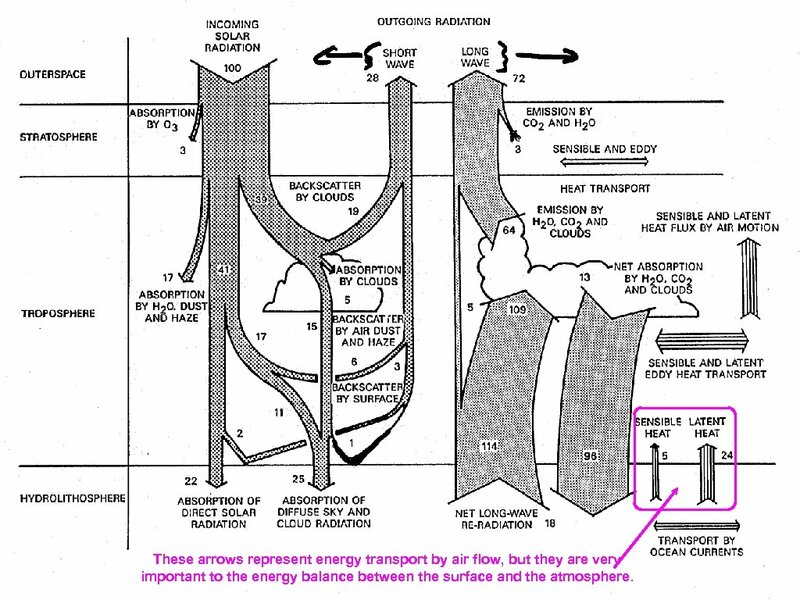 These arrows represent energy transport by air flow, but they are very important to the energy balance between the surface and the atmosphere. 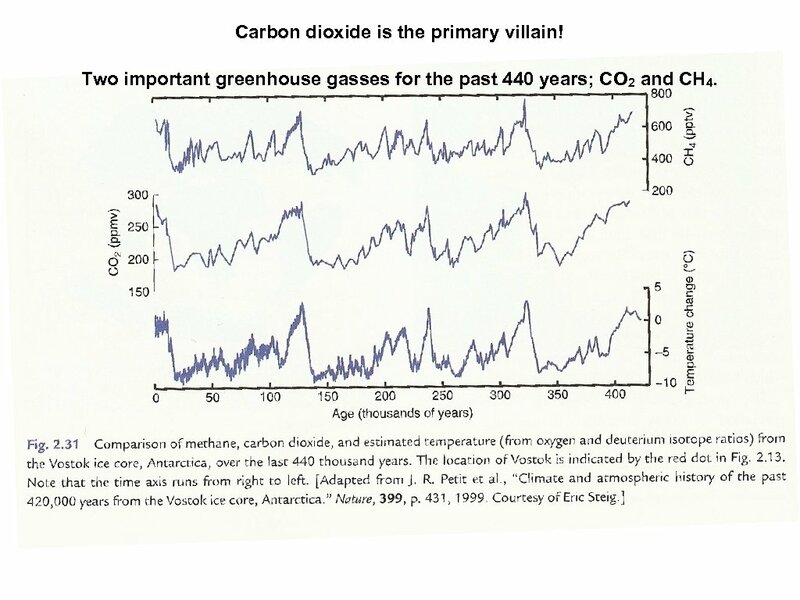 Carbon dioxide is the primary villain!  Two important greenhouse gasses for the past 440 years; CO 2 and CH 4. What has changed? This is what we have added! 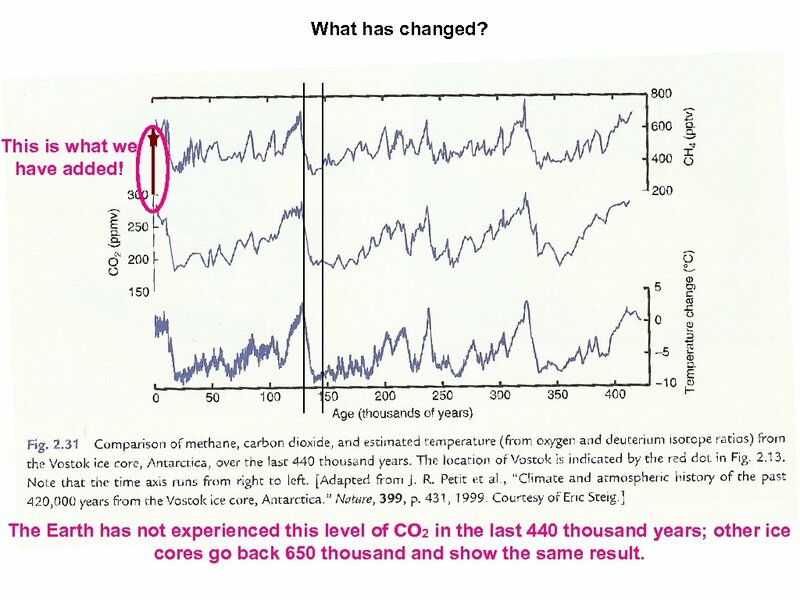 The Earth has not experienced this level of CO 2 in the last 440 thousand years; other ice cores go back 650 thousand show the same result. +0. 3ºC -0. 3ºC 0. 6ºC warming This is not very convincing. 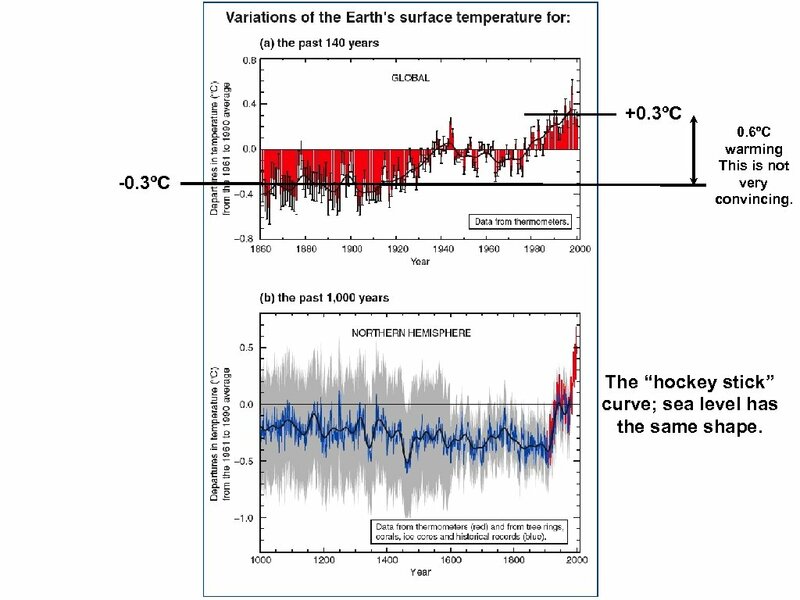 The “hockey stick” curve; sea level has the same shape. 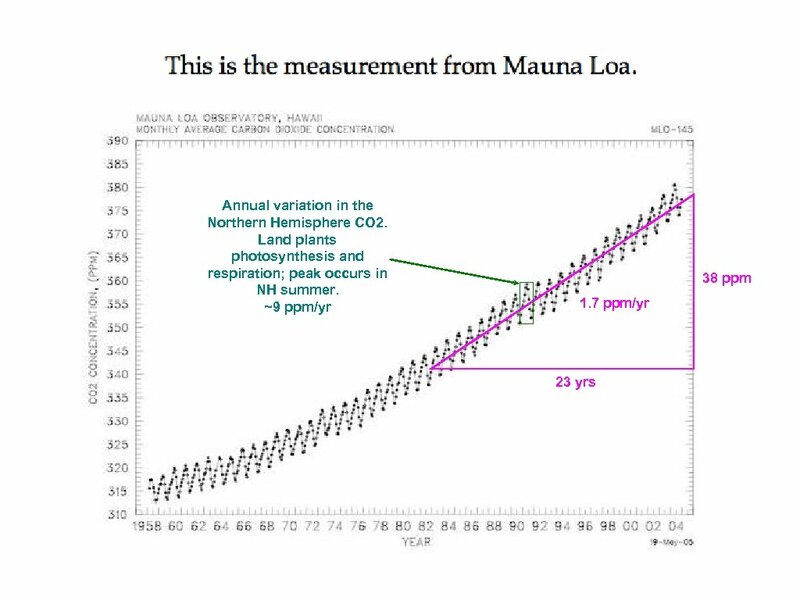 If all of our carbon emissions stayed in the atmosphere the CO 2 would exceed the measured amount. 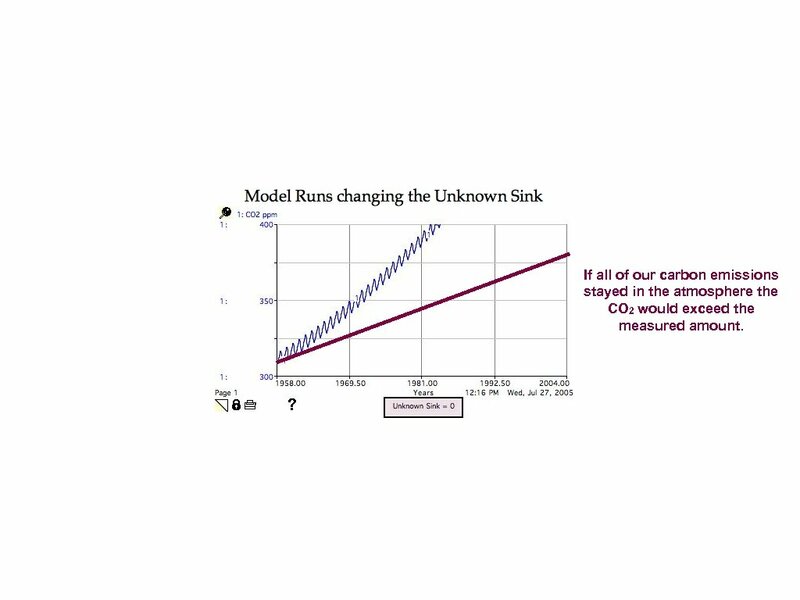 The previous result with Unknown Sink = 0 Setting the Unknown Sink to 2 Gt/yr improves the model output, but we are still not in agreement with measurements. 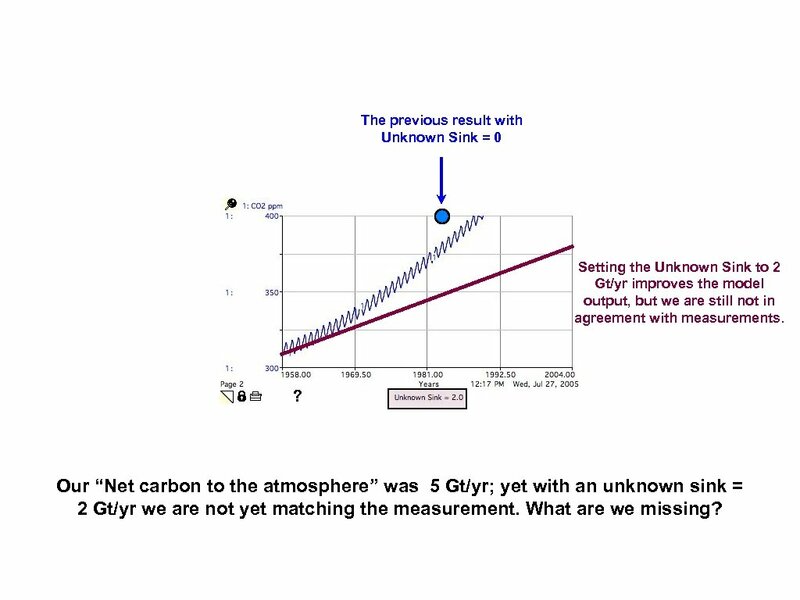 Our “Net carbon to the atmosphere” was 5 Gt/yr; yet with an unknown sink = 2 Gt/yr we are not yet matching the measurement. What are we missing? Temporarily ignore the red curve. The previous results with Unknown Sink = 0 Unknown Sink = 2 Setting the Unknown Sink to 4 Gt/yr improves the model output, but we are still not in agreement with measurements. Note the large deviation from the measurements in the last half of the model run. On this model run we have also displayed the carbon in the Land Plants, which we now see is decreasing significantly because of deforestation. 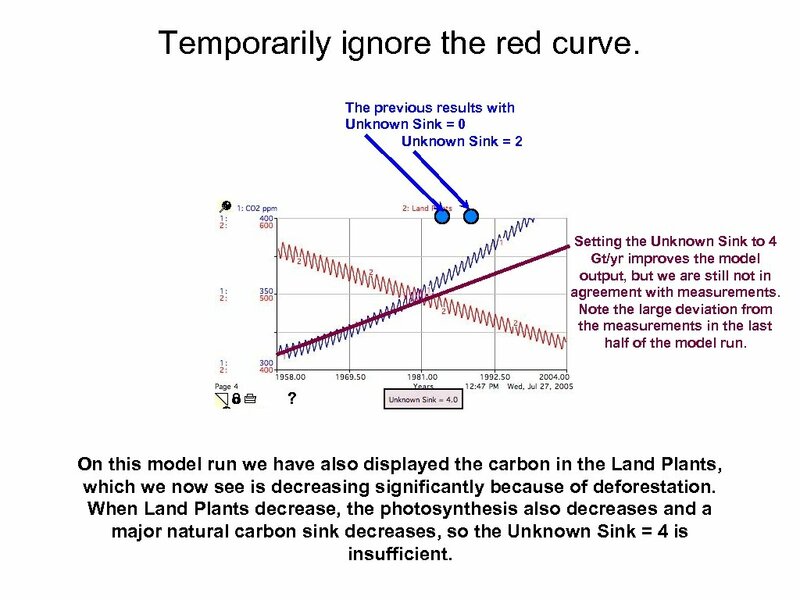 When Land Plants decrease, the photosynthesis also decreases and a major natural carbon sink decreases, so the Unknown Sink = 4 is insufficient. Hypothesis. Deforestation seems to be inconsistent with the CO 2 measurements. What if the “Unknown Sink” is going into enhanced forest growth to compensate for the deforestation? 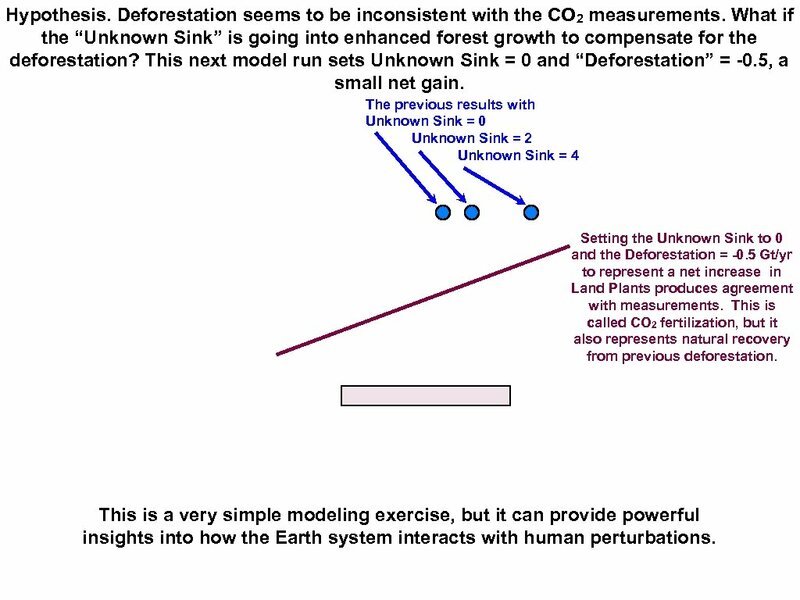 This next model run sets Unknown Sink = 0 and “Deforestation” = -0. 5, a small net gain. The previous results with Unknown Sink = 0 Unknown Sink = 2 Unknown Sink = 4 Setting the Unknown Sink to 0 and the Deforestation = -0. 5 Gt/yr to represent a net increase in Land Plants produces agreement with measurements. This is called CO 2 fertilization, but it also represents natural recovery from previous deforestation. 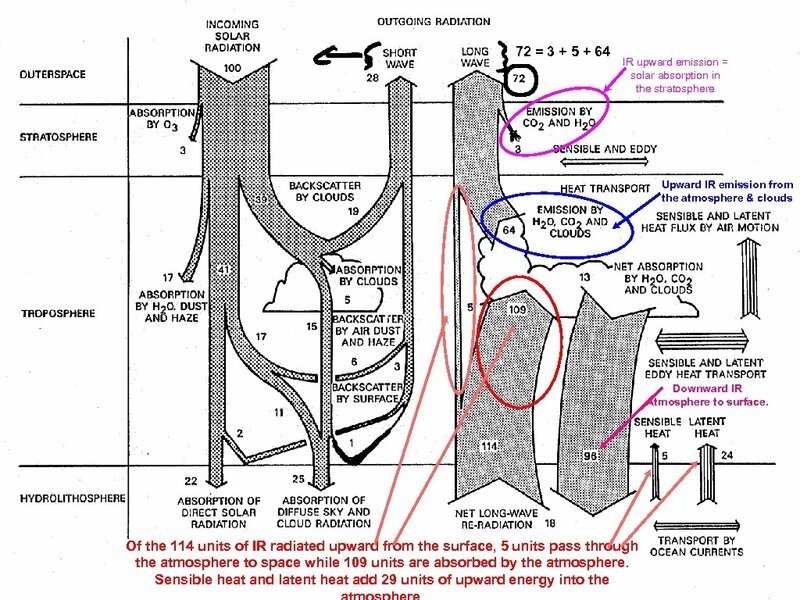 This is a very simple modeling exercise, but it can provide powerful insights into how the Earth system interacts with human perturbations. 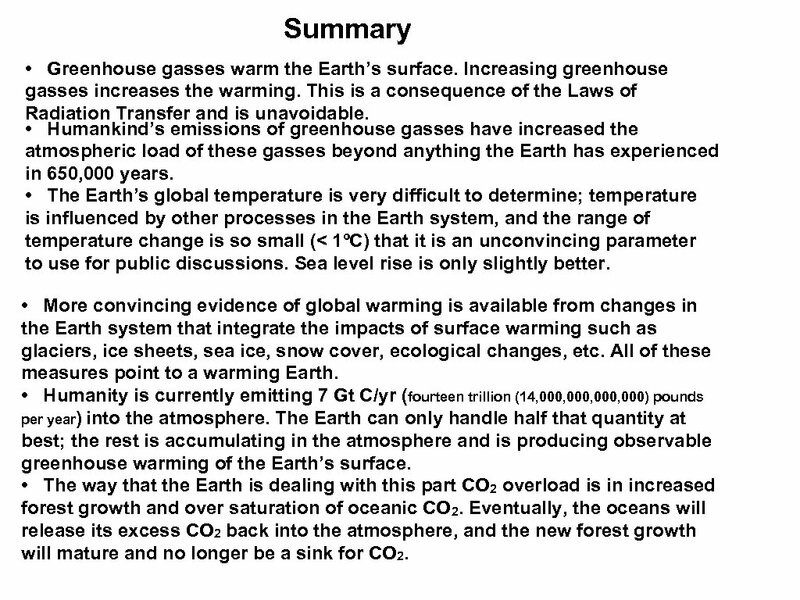 Summary • Greenhouse gasses warm the Earth’s surface. Increasing greenhouse gasses increases the warming. This is a consequence of the Laws of Radiation Transfer and is unavoidable. • Humankind’s emissions of greenhouse gasses have increased the atmospheric load of these gasses beyond anything the Earth has experienced in 650, 000 years. 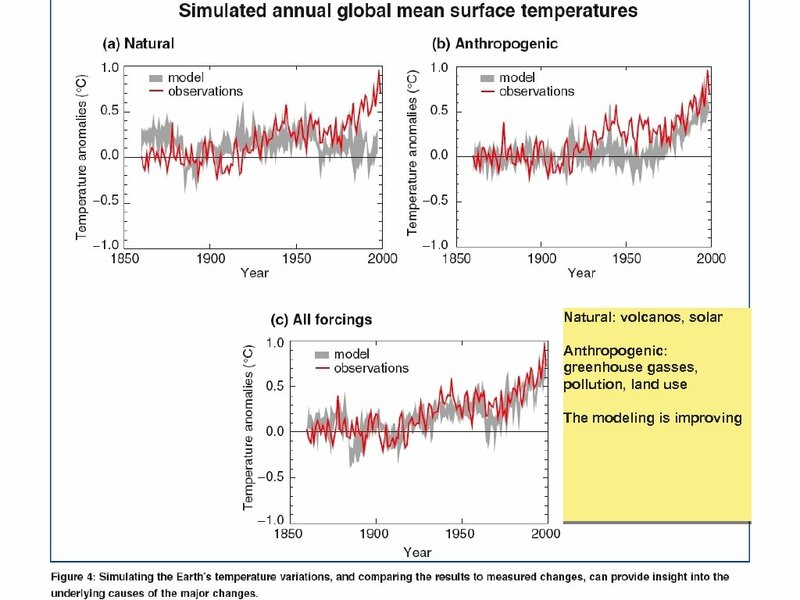 • The Earth’s global temperature is very difficult to determine; temperature is influenced by other processes in the Earth system, and the range of temperature change is so small (< 1ºC) that it is an unconvincing parameter to use for public discussions. Sea level rise is only slightly better. 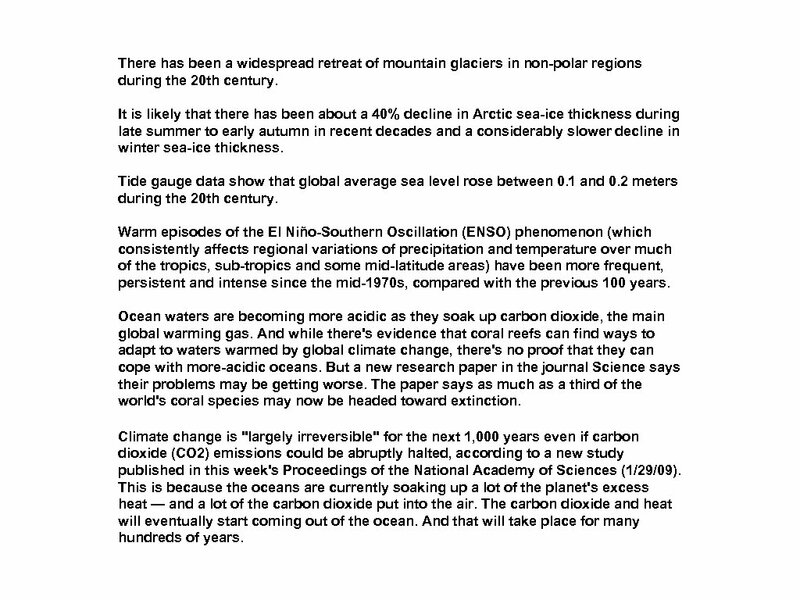 • More convincing evidence of global warming is available from changes in the Earth system that integrate the impacts of surface warming such as glaciers, ice sheets, sea ice, snow cover, ecological changes, etc. All of these measures point to a warming Earth. • Humanity is currently emitting 7 Gt C/yr (fourteen trillion (14, 000, 000) pounds per year) into the atmosphere. 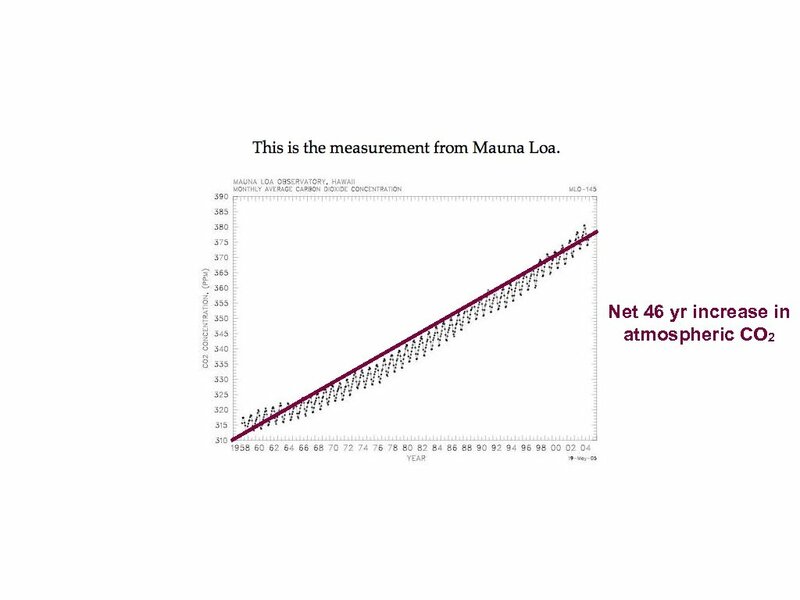 The Earth can only handle half that quantity at best; the rest is accumulating in the atmosphere and is producing observable greenhouse warming of the Earth’s surface. 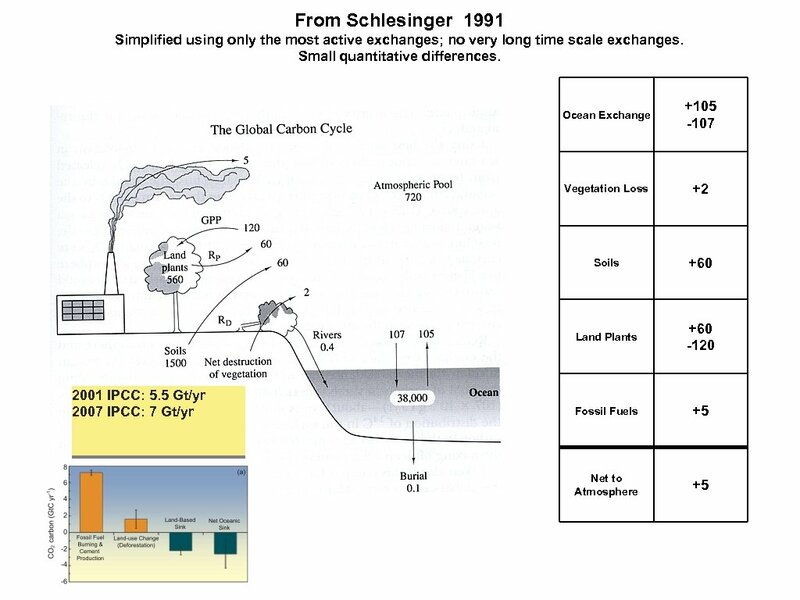 • The way that the Earth is dealing with this part CO 2 overload is in increased forest growth and over saturation of oceanic CO 2. Eventually, the oceans will release its excess CO 2 back into the atmosphere, and the new forest growth will mature and no longer be a sink for CO 2. So, what do we do? • The usual litany: energy conservation, renewable energy, etc. These will help and are good directions to move, but they are insufficient - too little, too late, but necessary. • More oil and gas production: This is the wrong direction but unavoidable. • Nuclear: Probably unavoidable - very expensive. • Geoengineering: (1)Fertilizing the oceans - probably won’t work. (2)Seeding clouds - questionable and expensive. 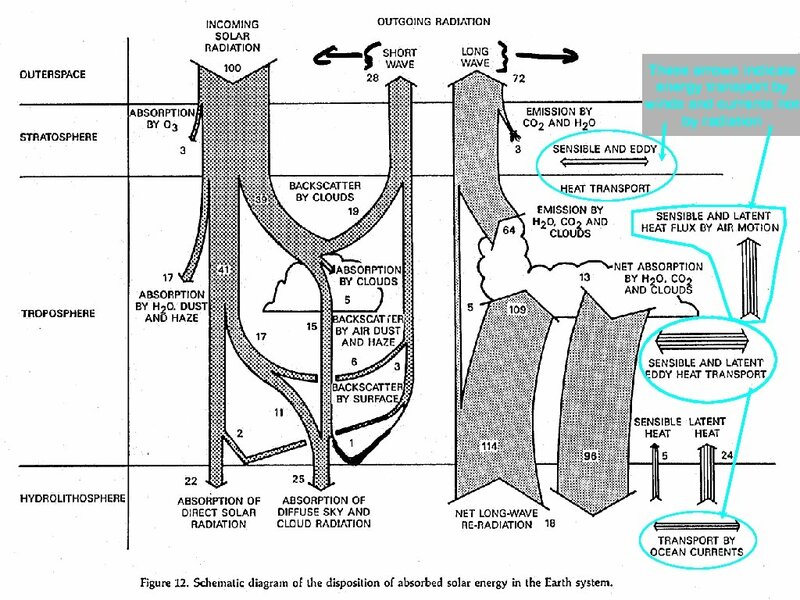 (3)Sequestering CO 2 underground - questionable reservoirs and expensive. 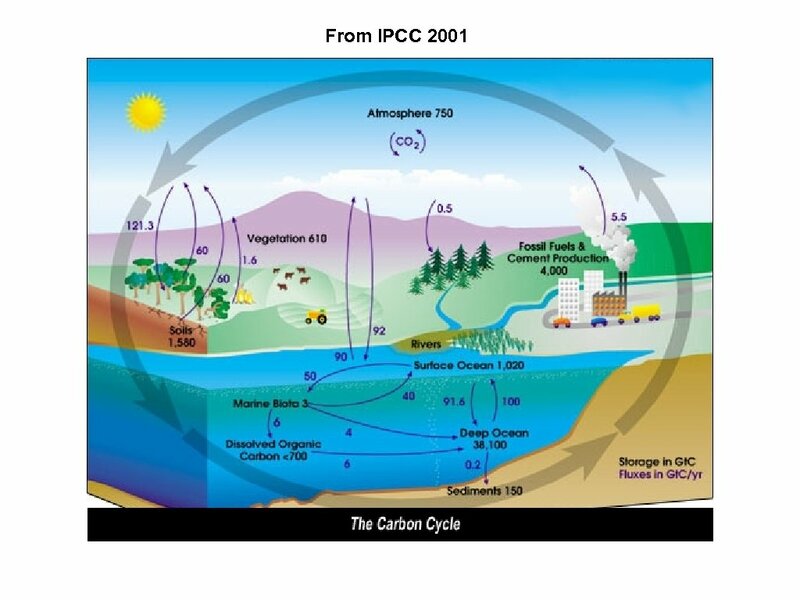 (4)Sequestering CO 2 on the ocean bottom - dangerous and expensive. My suggestion. • Listen to what the Earth is telling us. Put it in the oceans and forests. • Ocean storage is temporary and acidifying the ecosystem. • Reforestation and afforestation is also temporary unless managed continuously. Mature trees must be cut and used so as to remove the wood from the decay cycle. (1)Pulped wood will return to the atmosphere in short time. (2)Construction wood will be sequestered for much longer time. 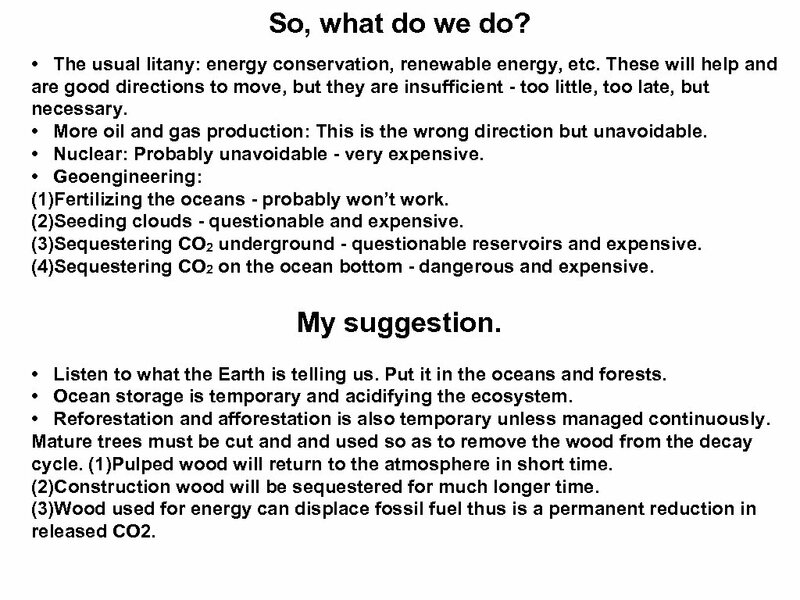 (3)Wood used for energy can displace fossil fuel thus is a permanent reduction in released CO 2. 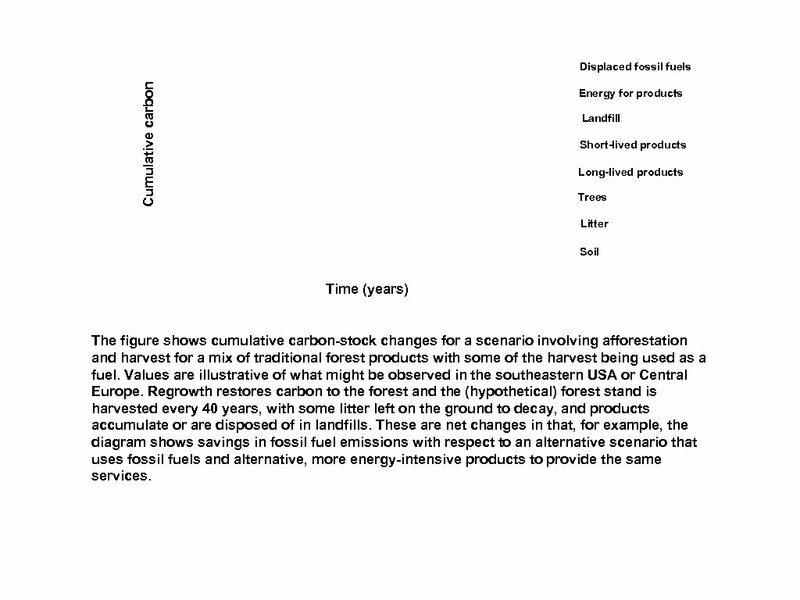 Cumulative carbon Displaced fossil fuels Energy for products Landfill Short-lived products Long-lived products Trees Litter Soil Time (years) The figure shows cumulative carbon-stock changes for a scenario involving afforestation and harvest for a mix of traditional forest products with some of the harvest being used as a fuel. 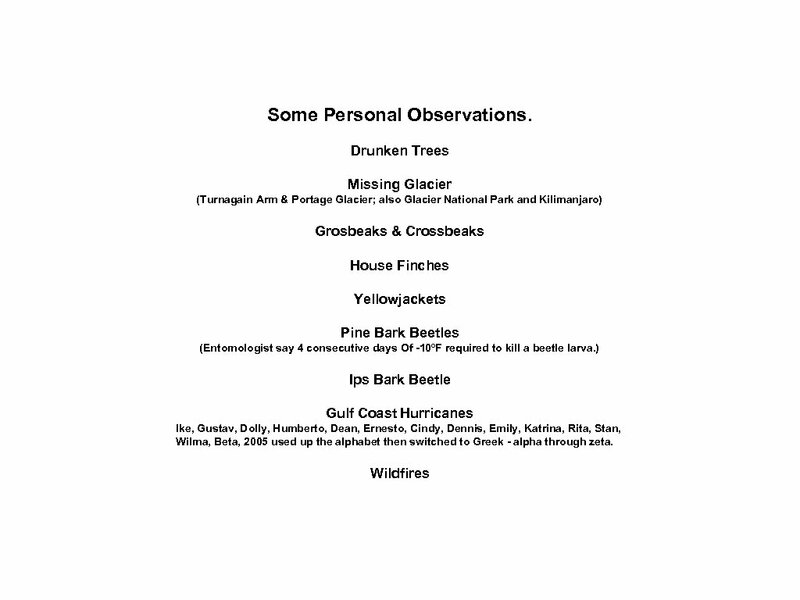 Values are illustrative of what might be observed in the southeastern USA or Central Europe. Regrowth restores carbon to the forest and the (hypothetical) forest stand is harvested every 40 years, with some litter left on the ground to decay, and products accumulate or are disposed of in landfills. 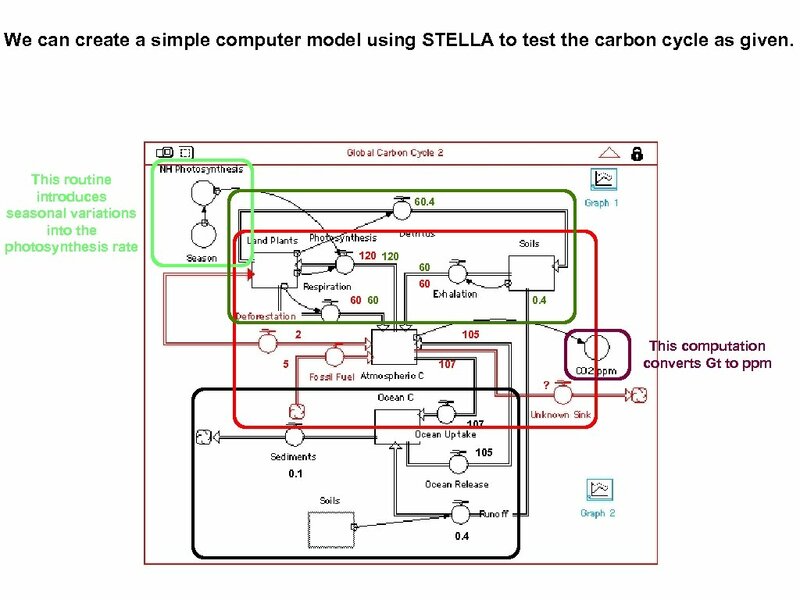 These are net changes in that, for example, the diagram shows savings in fossil fuel emissions with respect to an alternative scenario that uses fossil fuels and alternative, more energy-intensive products to provide the same services.